Heather Brook Le'amohala has been teaching vegan & raw food preparation classes since 1996. She currently teaches at UCSD through their Centers for Integrative Health sharing the benefits of a plant based diet with doctors, medical students, patients and the general public. She has co-authored an over 500 vegan recipe cookbook called "Incredibly Delicious - Recipes for a New Paradigm" which you can find on amazon.com as well as in book stores and health food stores around the country. Since 2006 Heather has owned catering and personal chef businesses (formerly "Mama Earth Cafe" and before that "Heaven's Kitchen") and has catered weddings, music events, parties, yoga retreats, festivals and more with healthy delicious plant based food. She has also been a personal chef and health coach to people who are healing from diseases like cancer, heart disease and rheumatoid arthritis. 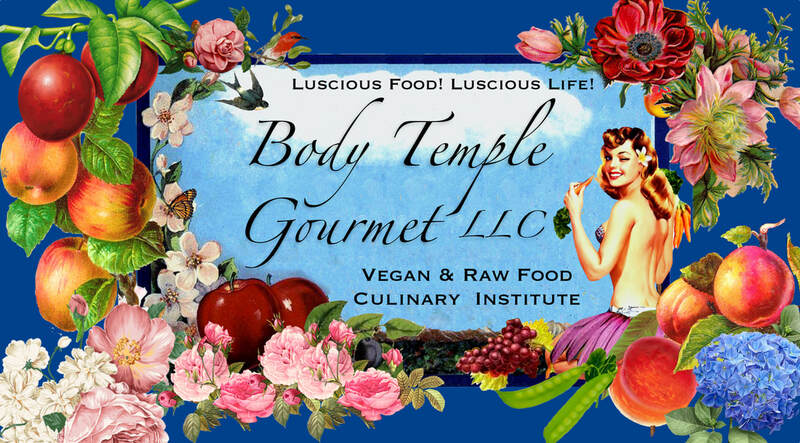 Her new business started in 2012, "Body Temple Gourmet LLC" Vegan and Raw Food Culinary Institute. At Body Temple Gourmet she teaches as well as hires guest chefs who are expert in their field of food prep to create a well rounded experience for the students. She was the main daily chef in a 10 person vegan community for 8 years which was her main on-going daily practice to lead her to where she is today (hands on daily immersion in vegan and raw food prep) The community had a gourmet vegan restaurant called "The Vegan Restaurant" in Paia, Maui for years. She worked in the raw food restaurant in Paia, Maui called "The Raw Experience" as a chef and food server. She has also taught raw food prep classes at "Great News Cooking School" in Pacific Beach San Diego and at other venues. She has a passion for health information and has regularly attended and prepared food for the Vegetarian Society of Hawaii monthly presentations. She is passionate about natural mothering, leaving a gentle wake upon the earth, animal welfare, health and environmental sustainability. She moved back to San Diego with her son (after her husband died) in 2017 and has started a new life in the Escondido area... www.mom-asana.com. Healing People and the Planet One Delicious Bite at a Time! "Your food is sacrament. Your food is medicine. Your food is love. It is a privilege to enjoy your raw vegan delights. Thank you!!!"